Update from Bognor, home of the A Graceful Death exhibition, the closing in of the year, and rain. Rain today is my friend. When I am in control of it, I love it. When I am not stuck in it and cold and wet, I love it. The sound of rain falling outside gives me a sense of peaceful melancholia, and because I am not actually miserable, I can indulge in a little nostalgic remembering. I have the sounds of rain playing on my laptop too, ten hours of it on Youtube, to help me to focus. It is white noise, and though I know ten hours of listening to a dishwasher would be the same thing, I can't bring myself to look for that on Youtube. There is romance in rain falling and none in dishes being washed. November has brought with it darkness, shorter days and a feeling of things ending. I am ready for this year to be closing, and feel comforted that though this is the last part of the year, a new one will follow and the cycle of ending and beginning will run as it always does. 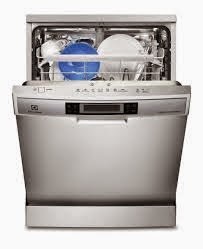 (Like a dishwasher programme). There is something peaceful about the expansiveness of Summer drawing to a close, and the prospect of closing in and folding up over the darker and quieter months of Winter. In the Summer, I wear colourful cotton dresses, flip flops and bright earrings; I hold my arms wide open to catch the sun and the light. I like to breathe deeply, smile into the sunshine, and feel the warmth and heat on my skin. There is so much daylight, there is always so much to do. I eat fruit, and scones, and think of the bigger picture in life. I imagine huge projects and plan extravaganzas with people who think like I do. Time is slower, and space larger, everything is possible. Today, November, it has all come to an end. It is dark at teatime, it is dark in the morning, and the rain is falling outside buffeted by the wind. I have to cover up to go out, and today I have chosen to wear black because it feels good and comforting. Now, I don't consider the bigger picture. I want details, to think things through and to make plans. I eat hot food and wrap myself in warm soft blankets when I sit down on the sofa in my sitting room. I wear a blanket in the studio while the heater makes my hands less cold. I put on my fairy lights in the hallway, in my sitting room and outside the studio because in so much darkness, the lights look like magic, like stars. Now I am curling up in my home, and feeling the need to sleep and to hide away. As I write this, over the sea in Bognor lightening is flashing, and over my house there is thunder. Banging in the Sky the children used to call it. I remember once being stuck in my car outside our old house in London with one of the children aged about four, in November, with the rain falling loudly on the car around us. In the darkness the thunder crashed and we had to wait for the deluge to stop just a little, so that we could run out of the car, up the street and into the house. That was where the phrase banging in the sky came from. It was magical being cocooned in the dark in a safe but tiny space in a violent thunder storm with a little child. The rain was so loud it was hypnotic. We held onto each other and imagined we knew who was doing the banging up there in the sky. We went through all our neighbours, friends and family, and by the time we had finished the whole lot of them, the little one was asleep in my arms. November and December will be less busy, as I have studio work to do and I am planning to get in there and paint. This means less hoovering, less food shopping, a lot less longing to see people who live half a day's journey away, and less thinking about my next mealtime. It is best if I give you bite sized accounts of October, which was a very good but exhausting month. A Graceful Death went to Ascot at the end of September, to a weekend festival run by an environment awareness movement called Ascent. My dear old friend Sharon Galliford and I did an adapted AGD for two hours, and very successful it was too. In every exhibition, there is at least one person who comes away feeling awakened and lightened. AGD has succeeded only when that person, or people, have come. At the Ascot exhibition, a man who had to leave the next day to see his dying mother for the last time, was able to come to terms with what was happening, and to understand something of what he was going to see and experience. My heart goes out to this lovely man, and wherever he is, I wish him peace and his mother a safe journey home. Swansea! AGD went up to Swansea to the Elephant in the Room event run by husband and wife team Kiera Jones and Jim Fox. Oh that was such fun. Utterly exhausting but so worth it. A huge event to inspire, challenge and reassure, with a new venture for an event like this, a play directed by Jim called Colder than Here by Laura Wade. Terribly funny and terribly sad, but oh so wonderful. 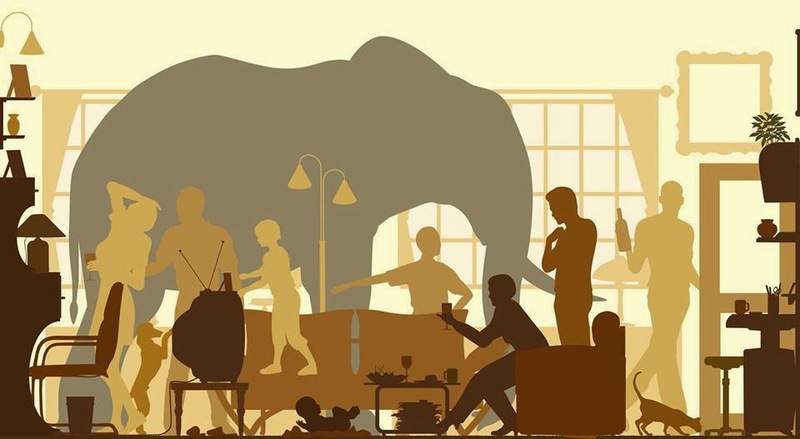 Here is another article from Dying Matters about the Elephant in the Room Event http://dyingmatters.org/blog/elephant-room . I love Dying Matters because they always let me write about what I am doing, and anyone who keeps saying Yes to me is a life long friend. The event was full to bursting with tea and cake, and I saw what I always knew, that Kiera Jones, alongside my dear friend and colleague Mandy Preeece, both are absolutely fabulous Soul Midwives. Both ladies really do the job. And Jim Fox is up there with Sarah Weller as a Sound Bath Maestro. I also met and talked with Dr Penny Sartori, who researches Near Death Experiences, Out of Body Experiences and all such astonishing and fascinating phenomena at the end of life. Penny struck me as a deeply intelligent, experienced and dedicated researcher. Her PhD is on these subjects and her latest book, "The Wisdom of Near Death Experiences: How Understanding NDE's Can Help Us to Live More Fully" is out now. I bought a copy and made her sign it. Actually we got on really well and I didn't make her do anything. Kiera and I hugging after her moving and powerful talk on Soul Midwifery. Kiera is a palliative care nurse and in her spare time, runs The Centre with Jim, offering free support and complimentary therapies to those suffering from life limiting conditions and their carers. Me, I'm holding a hot kettle because I was so cold and wouldn't wear anything to cover up my pretty jumper and so not look nice. Reiki. I have begun to practice Reiki from home. I love healing, and have always done it. Now I have a name for it, and a wonderful teacher in Mandy Preece. I have a healing room and have begun to do an hour long session for anyone that wants to come. I charge £30 for the hour, and am thinking of extending it to cover conversation afterwards, as it seems some clear and profound thinking comes to my clients as they sit quietly afterwards. Here is the best picture yet of my darling friend Claire after her latest session. 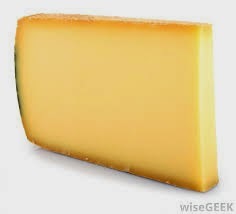 Claire and I fell about laughing at this and don't be put off, if you do look like this after, it will feel lovely. Claire does not suffer fools gladly and would not allow Reiki if she didn't feel safe. So when I took this of Claire and we saw it, we nearly fell off the sofa laughing. I promise I won't laugh at you though if you come for some healing. Unless you are very funny and then I will tell you it is part of the healing. Qi Gong. I have started Qi Gong and the first time I did it I felt so sick I had to sit down. You have a good mind, and good energy, the teacher said, but no essence. So in the hope of finding some essence I have been practising it every morning. I am no longer sick, and am going back tomorrow hoping he will feel sorry he ever said I lack essence. It will be shooting out of the top of my head and that will be that. Paintings - I am doing another of the God's Life series. I have done God's Study, God's Kitchen and now I am commissioned to do a third. God's School Day. Here is the original God's Study, I have done a good few of them now. So far, only one God's Kitchen and God's School Day though. The original God's Study. The God's Life series are a snapshot of the room God has just popped out of, and we get to glimpse into what is happening for the few moments God is absent, answering the door, or putting the cat out. 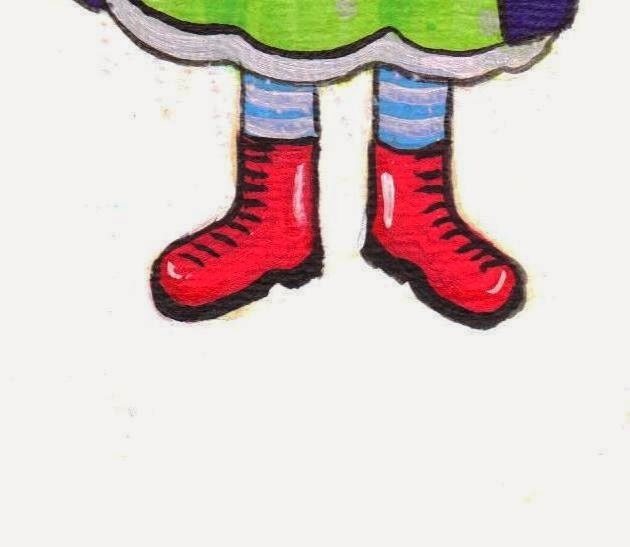 The ones I do now are customised to include references to the person who is commissioning it. And finally. Father Dominic. I am painting my youngest brother as the final painting for AGD. After this last painting, I will do no more paintings for A Graceful Death. It will be big enough, and Dominic is a most wonderful subject for the final painting and interview in this most extraordinary of exhibitions. Dominic is living with stage four bowel cancer, and is doing well after much surgery and chemo. But his life and expectations are different, turned upside down, and he has shown enormous wisdom and humanity in his acceptance - and fighting the fear of - his cancer. I have been raising money to pay for the painting, and all the work that goes into creating the interviews and writing to accompany the portrait. I have raised £600 so far, and am so grateful for the love and kindness shown to Dom. Here is the Go Fund Me page. Have a look, read what I have said, and if you wish to, make a donation. http://www.gofundme.com/es6suc I cannot pretend I don't need the money, so please do what you can. And a million thanks to all those who have already donated. Thank you. If this blog was a play, you would need an interval now. So off you go, have some tea, and have a lovely quiet thoughtful November. Wrap yourself up warm, spend time listening to the dishwasher if it isn't raining, and we will meet again in December. I look forward to it. I would love to say this is me doing Reiki and laughing, but it isn't. It is taken by my son, Giant Boy after he has been telling me jokes. See you all in December. I am sitting in a bed and breakfast in Carrick on Shannon, County Galway, in the late afternoon, while mother rests in her room next door. I am sitting in my room on a chair with cushions watching the rain fall outside. I got the nice room with pink pillows and space for two chairs. Poor mother got the room with just enough space for a huge double bed with a black cover, black lampshades and no chairs. Her room smells overpoweringly of bleach; we think either someone dropped a bottle of bleach, or it's a quick clean up after a murder before we arrived. I am spending this week with Mother visiting her cousins in Ireland. Like Mother, the cousins are old now, eleven of them between the ages of fifty seven and eighty, though she is the oldest at eighty four. I have been meeting people for the first time that I have heard about since I was a little girl. I have visited the old farm where the cousins were born and grew up, where my mother stayed as a child, and it feels ridiculously familiar, as I have lived there too. I recognise the faces of these cousins of Mum's as if I had always known them, and they have absorbed me into their conversations with her as if I have always been sitting with them, watching them from a distance. Here in Galway, my mother spent her childhood visiting from England with her mother, my Irish Grandmother, in the 1930s and 1940s. When war broke out, Mother was sent to live with her Aunt Nina in Portarlington, County Offlay, while her youngest brother and sister went to their Aunt May nearby. Mother's time in Galway with Nina were among the happiest of her childhood. When I was little, I loved to hear stories of her days in Ireland, the way she was met from the train in a pony and trap; the way her Aunt Nina thought she was too pale and thin, and fed her on beef tea and made up her bed in pretty linen sheets. The way Nina taught her how to clean silver, to feel the quality of good material and to wash and keep lace. 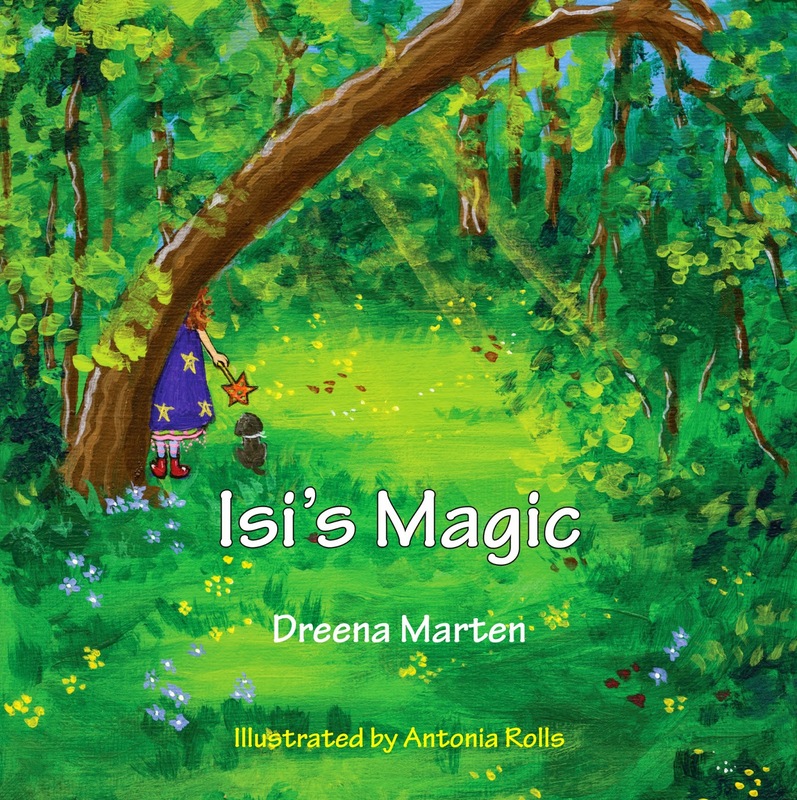 Probably the most important thing was that childless Aunt Nina saw in my mother a shy, sickly, skinny, nervous little child and looked after her so that she blossomed, and grew stronger with Nina's undivided attention. My Grandmother Louisa Fitzgerald, her two sisters and brother were born in a tiny farmhouse in Castlegar, County Galway. When Louisa's father died suddenly, her brother Paddy took over the farm as a very young fellow indeed, giving up his education. The farm, mother told us as children, and according to all her cousins who were born and grew up there, Paddy's children, was basic. There were two rooms downstairs, and four upstairs and no lavatory. No electricity or water, and no road or path leading into the house. We came over the fields, they said. The pony and trap would take you so far, and then you would branch off walking across the fields. There was a well a mile or so away for the drinking water, and rain butts caught water for washing. Paddy later married Nell, fourteen years younger than him, and had eleven children in that little house. My mother said Nell would cook on the hearth, with big iron pots on trivet stands, and a system set up to hang kettles and cauldrons up over the fire. It is these eleven children that we have come over to see this week. These are Mother's cousins, with whom she played while she grew up here in Ireland. Not all of them are alive, some we can't see this trip, but those we have met up with again, have greeted Mother as if it were only last week she was here, talking and laughing about all the things they remember. The oldest of the cousins is eighty and the youngest is in her mid fifties. Mother has been back here to visit all her life, has been a part of this family for ever, but I have not met them and I have not seen the farm house, and I have only imagined how it was for them all. And now that mother is eighty four, she is the oldest surviving member of her generation, and it is becoming more and more difficult for her to do this trip. My grandmother had seven surviving children. Paddy, her brother and Nell, his wife, had eleven. May and Nina, though married, didn't have any children. There was much coming and going between the eleven in Castlegar, and the seven in Bourneville, Birmingham. All their faces look familiar to me, and I want to sit forever and hear them talk. Kitty, my mother Maureen, and Teresa at Teresa's farm in Ahascragh, Gallway a few days ago. The three oldest of the surviving cousins. Kitty has 9 children, Mother has 4 and Teresa has 6. I see my mother's delight at being with her cousins. A moving moment was seeing her pleasure on the drive up the road, built in the 1950s, to the old farm in Castlegar. Her cousin Padraig came out to see her, now an old man, walking with difficulty, dressed in his fresh pressed shirt, his black shoes polished and his hair smart and brushed. The strength of his handshake was a wonderful experience. Padraig took over the farm, and has never left it. This is where my Grandmother was born. I adored my Grandmother. She died when I was twelve, in our sitting room after a long illness, and the person I loved most in the world went for ever, she would never come back. I loved my mother of course, but grandparents can be magical in the way that parents with all the hard work of day to day living with raising children, simply have not the time for. I had always wanted to come and see where she was born, and perhaps feel that I could find a bit of her again. Well, the shock of it all was that when we arrived at mother's cousin Kitty's house on our first day here, the lady that I met was the image of my Grandma. It took my breath away. I have spent this visit gazing at Kitty, watching my Grandma in her face and expressions, feeling that after all, she is still here. It was good that Kitty was the one who took us to see Padraig at the farm, where they, all eleven cousins, and my Grandmother and her brother and sisters a generation before them, had been born. Mother and Padraig. This house is like my own Grandmother's house, and I want to stay here for ever. This is mother's visit, but I am in a whirlwind of memories and associations, and I have found the connection to my Grandma that I have missed for so long. This was her world, and I believed as a little girl that I belonged with her in her world. It has taken me until the age of 54 to come and see it. And so. I am sitting in my bed and breakfast room, gazing out at the rain, feeling as if I was always here, and feeling too as if I know nothing at all. Mother is asleep next door, on her black bed, gaining strength for tonight, we will be visiting more cousins. She is very old, and feels her age, but she is utterly sound of mind, and remembers everything. We visited the house belonging to her Aunt May, her cousin Fr Joe Fitzgerald took us. The lady living there welcomed Mother warmly. Mother was able to show her where the chickens used to lay their eggs in the guttering high above the barn, and where she and the Fitzgerald cousins would find them. Mum doesn't think she will come to Ireland again, this is her final trip. I understand, possibly she is right. The cousins here tell us that we should visit again soon, they say I will be welcome back to see them too, and I want to take them up on it. But without Mother, I will have to forge my own history, have my own experiences, and be myself. The link to these cousins of hers, their families, and the farm they grew up in, and life here, this link is my mother. I have no real way back to the past and into this life, except in her company here. This week, I have watched and listened as she met again and introduced me to these amazing people that I had been aware of for ever. I have been welcomed, absorbed and accepted into Mother's past, into their company, and I have fallen in love again with the characters and the people I loved to hear about as a child, this time falling in love with them in real life not just in the stories. It is so good to see my mother completely at home, a part of this world, and it is so good that I have at last seen it for myself. I will leave you with a silent snippet of Padraig leading Mum to the field where they used to cross to arrive at the farm. The sun shone then as it does here. Once these two would have run over this land. I wish I had been there too. Mother and Padraig, revisiting the field they used to come over to get to the farm. Padraig was born here, as was his 10 brothers and sisters. He ran the farm after his father's death, and is still there now. Sparkly Send Offs. A Best Seller. It is very late, and getting later. Sounds like the title of a book I may write or a film I may make, considering what I do. End of life and stuff. What I mean is that it is already late on Sunday night, and I have not written to you all for two weeks. You may be sitting in the dark somewhere, crying, wondering what did you do to make me stop writing. You may not. You may have forgotten you ever read a blog by me, and be planning a wonderful day out with really interesting people. It is very late tonight, nearly 10pm, and I am only just beginning to write. I have been thinking. This Summer has changed things in my little world. I finally faced up to the difficulties with my son, and saw how long things have been very, very bad. I saw wilful avoidance on my part. I hope there is a good ending to this story, but at the moment, I have no part in it, and do not, cannot, make things better. I am, I accept, powerless. My brother Dominic agreed to be the last person to be painted and interviewed for the A Graceful Death exhibition, and with very mixed feelings, I have tried to start that painting. We have had one interview, and will have another soon, and I have been avoiding having to paint him. When I look at Dominic, I see myself. And, funnily enough, I see our other two brothers too, and Dom's face becomes a mixture of all of us, Ralph, John, Dominic and me. We are all there, when I look at Dom, and I am struck by my own mortality. Dominic is living with advanced cancer, and working hard to defeat it. He may well do so, we don't know. But as you all know, who have had any dealings with life limiting illness, everything changes forever. And of course, paradoxically,the same life goes on regardless, without a backward look. It has been very difficult to know what to do recently. My head has been both full of worry and empty of solutions. I almost shut up the studio, put on a false moustache, changed my name to Miguel, and pretended to be someone else. That would have been easier than being here I thought, in Bognor, with a Studio I wasn't using, a mind that was full of sawdust and nonsense, with difficulties at home, and a growing sense of sadness with the world. What this all boils down to, my dear friends, is that one part of my work is coming to an end, and another is beginning. I say this now, though even a week ago, it was not so clear. This kind of thing is seldom linear, logical and efficient and so I met first with a brick wall. In dealing with this brick wall, I found eventually, that there were ways round it, and that it wasn't as tough and final as it seemed at first. I spent much time sitting down and gazing stupidly at it, believing that it was as big and alarming as it looked, until ways to get up and tackle it began to present themselves. Things are much better now, and I believe I have made my decisions. Here they are. I will write the blog once a month, not once a week. This will keep you on a knife edge. What is happening in Bognor? you will say, and no one will know. You will have to wait for the beginning of every month to find out. This will be good for you. You will learn patience. And I will practice perseverance. That will be good for me. Win win. I will start my book. We all have a book in us, I have one that has struggled to find form for years, and with the working title "Sparkly Send Offs" I think I am onto a winner. It combines the end of life with being a fairy and this working title gives me immense joy. It is completely ridiculous, and we can thank my dear friend Sarah Weller, Sound Therapist extraordinaire, for coming up with it. Complete nonsense. Wonderful. The Conversations project is the way forward. 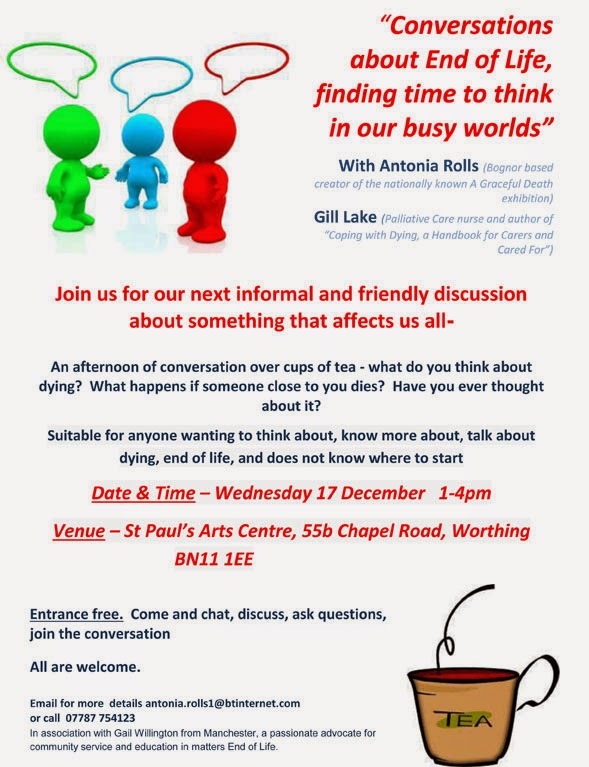 I have been holding two hourly sessions in the community for anyone to come and talk about any part of the end of life that is on their mind. 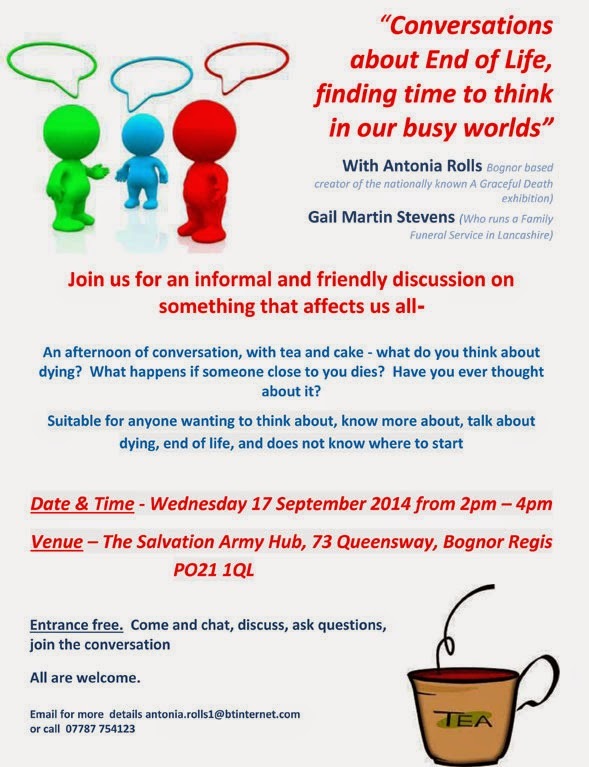 There is, as always, tea and cake, and a gentle and open forum for discussions on end of life matters. The last one held at the Salvation Army Community Hub this week, covered atheism, suffering, laughter, and euthanasia. The idea is so simple. "Finding time to think in our busy worlds" is the strap line on the posters. The A Graceful Death exhibition needs a permanent home. It is now time to set it up properly and permanently somewhere where it can be accessed by those that want to come and see it, respond to it, and meet the people who have left us their images and their words about how they are doing their dying. Or living. Some are still with us, some are not. The one thing they all have in common is that while we are painting and interviewing them, they are living and living with full intent. It's time that it was set up, all 52 paintings, the films, videos, the music, poetry and essays, all of it ready made so that it could be used to help us start to think of and believe, our own mortality. There will be no more paintings after Dom. If AGD now has a place to stay, for however long, it would work very well. I am open to ideas. Probably somewhere near me now, in Bognor, so that I can maintain it. It can still travel. I love the idea of having a van with the A Graceful Death logo on it, as it travels the length and breadth of the country, full of paintings of dead and dying people, being avoided on the motorways as people would do anything rather than follow behind, overtake or have anything to do with a van full of things about dying. Dominic's portrait is the last painting that I will do for A Graceful Death. I will be finishing this part of the project with a beautiful painting of my youngest brother. There is talk of making a small film of Dom as a finale to the creative and expressive work that has been the A Graceful Death exhibition and project. I hope that we do this, Dominic's experience and his ways of keeping himself going, are very valuable for when we may need such advice. We all will need some preparation. We are all one day, going to be finding ways to try to die well. There is something else I have been made aware of. I, we, all of us, need to express. Creativity is a most glorious tool for us to use when we are feeling low. It is counter intuitive, the last thing you feel like doing when you are moping into your twenty ninth pot noodle in your smelly old pyjamas and not answering your phone to anyone, under the sofa in the sitting room for the fourth day in a row, the last thing you feel like doing is to doodle. Write. Play the piano. Make something. Paint something. Arrange some flowers. Cook something. The very last thing you think of, would be to express what is in you now. But, it does something to the grip your sour, insular mood has on you. Not expressing yourself is a sure way to remain under the sofa. Having said I'm looking for a permanent home for the exhibition, I'm now going to tell you how it won't be around in it's new permanent home on these dates. It will be temporarily impermanent. Sunday 28 September AGD will be at the following from 3pm to 5pm. Come and see me there, I'll be with a section of the exhibition in the actual Church. & Sunday September 28th (3 to 5) £5 I'll be in the church with AGD here. AGD will be a the Elephant in the Room event at the Swansea YMCA. The Elephant In The Room is a four-day event to be held in Swansea from 30th October through to the 2nd November. The centre-piece of which will be the hugely successful, and much talked about, art exhibition “A Graceful Death” by Antonia Rolls. Alongside the exhibition we will also be presenting a programme of talks and workshops, together with evening performances of the funny and moving play, “Colder Than Here”, written by award winning playwright, Laura Wade, as well as an opening musical concert on the Thursday evening. There will also be a number of exhibition stands relating to the theme of the event. It is our intention, through The Elephant In The Room, to bring, what is often a taboo subject, out into the open, stimulating awareness and encouraging discussion around the subject of death and dying. Through the talks and workshops we plan to cover a range of areas, including end of life care and support, funeral planning, the approach to death in different cultures and faiths, planning and writing of Advance Decisions and Wills, being prepared, the options available at the end of life and awareness of choice, and much more. We will also have question and answer sessions with a panel of experts in their own related fields. Apart from the theatre and musical performances, entrance to the exhibition and all talks and workshops will be free. Refreshments will be available throughout the days in exchange for donations. The programme of talks will run from 12 noon until 4.30 pm on Friday 31st October and from 11.00 am until 4.30 pm on Saturday and Sunday November 1st & 2nd. All the proceeds from the event are going to fund the work of The Centre in Swansea, in providing free complementary therapy treatments and support to those living with cancer and other life-limiting conditions, and also to support Antonia Rolls and her “Graceful Death” work. We hope you are able to join us for what promises to be a wonderful event. It is nearly midnight now. Time to go to bed. Life goes on, and tomorrow is another day. The next blog will be in October and in the meantime, I will start Dominic's portrait, and find an opening sentence for Sparkly Send Offs. I do remember a few years ago, come to think of it, a lady in her seventies watching over her daughter in her forties who was dying of breast cancer. As the daughter entered her final few days, the old mother hung fairy lights all around her room and turned off the lights, it was magical and wonderful. Perhaps that is the true Sparkly Send Off. Conversations on the End of Life, Father Dominic and a Marmite Sandwich. I will not keep you long this week. You will only have time to sit down and eat half a marmite sandwich, before you have read it all, so be prepared. I broke my best little teapot in the sink. I have another, but the tea cannot taste the same. It is hard to believe my little teatime friend is no longer with me. I have lurched to the other small teapot in a state of heartbroken resignation, but we are not used to each other and this relationship will take time. 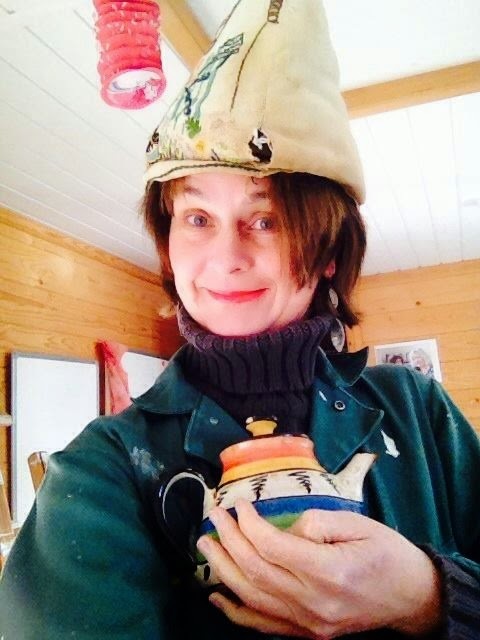 It is good to know that if this teapot too is taken away from me, I have a third and final small teapot and take comfort from knowing that even if I do suffer another loss, it is only a traumatic emotional loss. On a practical level, I will still actually have my tea. I began my role at the Hospice as a Companion, sitting with people who need someone with them. I am grateful to the people I sit with. Thank you. Giant Boy is jolly. He has everything to live for, he has a new girlfriend who doesn't seem fazed by his eccentricities. It seems, and it is early days, that she has not noticed them. It seems, and I am impressed if this is true, that she simply accepts them all. Giant boy is chirpy and has played her some Debussy (loudly) on the piano, and has not taught her much MMA. I think he would rather gaze into her eyes and he can't do that if he has her in a headlock. Other plans for this week are to finish God's Kitchen, a painting of God's Kitchen as God has just popped out to answer the phone. This is what I think we would see if we passed by and glanced in; and I aim to start the last painting for the A Graceful Death exhibition, of my brother Dominic. Dominic is living with serious cancer and is enduring the treatment that goes along with it. Dominic is a Catholic Priest, and has a wonderful, simple and articulate way of talking about this disease that has struck him seemingly out of nowhere, at the age of 51. I have been avoiding having to deal with this painting, but now I feel I am able to do it. When I see Dominic, I see myself. I will see what happens when I do it, I will see where it takes me. I might go for a run. I might. Ten years ago this year, in 2004, I completed the London Marathon running for the Samaritans. Good Lord, I am still recovering. I did enjoy most of the day. It is true, the atmosphere really does carry you through. People lined the route and if you wrote your name on your hat as I did, they all call your name. Everyone loves me! You think, They know me! until they start calling your name wrong and you realise the rain is making the tippex name on your hat melt. One of my memories is the kindness of people trying to feed you as you went round, handing chocolate bars, sweets, biscuits to the runners as they passed. I passed one lady in the Isle of Dogs who had set up a trestle table with bread and margarine and marmite, and was trying to help the runners with chunky sandwiches. You would have to stop, eat the sandwiches and then lie down to digest them, so no one was stopping. Lovely idea though. Back to this week; if I do go on a run, I will take my own marmite sandwiches just for old time's sake. 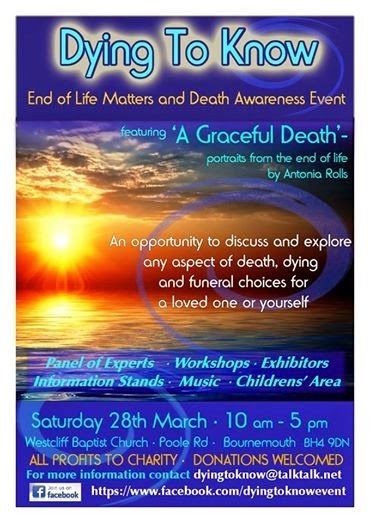 It is time to bring the A Graceful Death exhibition to Bognor or Chichester. And it is time to find a place to show it permanently, time to bring it home. I am looking for a place to set it up so that it is ready for viewing for the general public permanently. It has a serious place in the awareness raising of end of life matters, with 52 paintings, poetry, videos, interviews, essays, memories and books in which to write. It helps people talk about what has happened in their lives, what is happening in their lives, and what is to come. It has inspired people to find out more about what they can do for themselves, and for others, around dying in their families and communities. And so, to end, a photo of Father Dominic, my youngest brother. I will be working on Dominic from a selection of images, so if I don't get it right, you can tell me so. Dom has a pic line attached to a kind of plastic ball filled with chemotherapy medicines, the ball is kept in his pocket. I will paint him with the ball visible.